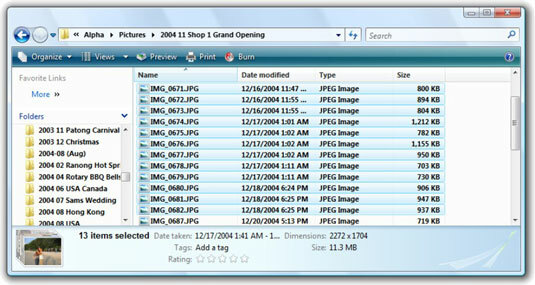 Do you have a bunch of files with meaningless files names, such as IMG_0671.JPG, IMG_0672.JPG, and so on? To make your files more useful, you need to give them names that mean something. You could rename these files individually, but there is a way to rename several related files at the same time in Windows Vista. Bear in mind that Vista’s ability to rename groups of files is limited. It originates in the fact that you can’t have more than one file in a folder with the same name. If you try to save more than one file with the same name in the same folder, Vista will add a number to the end of the name to distinguish the files. You can turn around this restriction and use it to your benefit. So, for example, if you have 20 pictures from your cousin’s birthday party, you can rename them all Cousin Bills Birthday and Vista will distinguish each of the files with a separate number. It’s not perfect, but any identification at all is better than IMG_0671.JPG, eh? Select the files you wish to rename. You can Ctrl+click to select individual (noncontiguous) files, or click at the beginning of a bunch, hold down the Shift key, and click the last of the bunch. Right click the first of the bunch and choose Rename. Type in a name that identifies the whole bunch. Make it something you’ll remember, such as Sandwich Shoppe Patong. 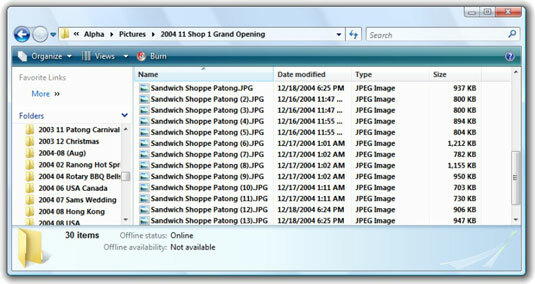 Explorer renames the first file Sandwich Shoppe Patong.JPG, as expected. It calls the second one Sandwich Shoppe Patong (2).JPG, then Sandwich Shoppe Patong (3).JPG, and so on. You can undo the naming, one file at a time, by pressing Ctrl+Z.